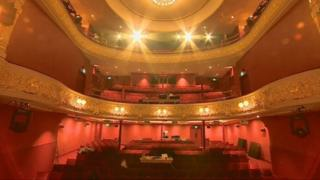 Perth Theatre has welcomed its first audience in almost four years following a £16.6m refurbishment. The theatre's 500-seat B-listed Edwardian auditorium staged a production of pantomime Aladdin after being restored to its former glory. A new 200-capacity performance studio has also been created to encourage new writing, music and dance. The theatre closed at the beginning of 2014 in order for the work to be carried out. The theatre's new box office, cafe, bar and shop reopened in November. Artistic director Lu Kemp said the theatre's actors had to contend with building work while rehearsing for the pantomime. She said: "It's been hilarious. At times we've had rehearsals where a couple of builders with a very long pipe will walk through the room. "But it's nothing that's ever got in the way of rehearsals, it's just added an extra layer of hilarity to the whole event." Donald Sutherland and Alec Guinness are among the stars who have performed at the theatre, which also launched Ewan McGregor's acting career in 1987. The theatre, which originally opened in 1900, is operated by Horsecross Arts. Its chief executive Gwilym Gibbons said it was a "cornerstone of a creative regeneration of Perth". He added: "Something around about 30% to 35% of tourism is driven by culture. "Perth is placed in a fantastic location in terms of developing that visitor economy."